The fourth century author on military matters Vegetius tells us of recruits that they "ought to have alert eyes, erect head, broad chest, muscular shoulders, strong arms, long fingers, a small waist, slim buttocks,and legs and feet that are not fleshy but sinewy and strong"
The Roman Military Research Society of the 21st century sets no such conditions but asks only that members share an enthusiasm for the Roman past and a commitment to authenticity, education and enjoyment. We are a welcoming and lively group with membership from all over the country (and abroad) and from a wide range of backgrounds and professions. A number of families with children regularly participate whilst our legionary age range is from 16 to 'over 60'. Under 16 year olds are welcome to join but they MUST be accompanied by an adult and would not be able to participate in the drill display. We also cater for very varied interests and members are encouraged to develop their own areas of expertise. Although legionaries and auxiliaries do have a military command structure whilst on parade, decisions affecting the Society as a whole are made after open discussion and debate. Full membership is £20 per annum for an individual / family. Full members are covered by the Society's public liability insurance when taking part in events on behalf of the Society. Drill squad recruits receive a Drill Manual and all new members receive a members' hand book and the current issues of Imperial Courier and Cornu. 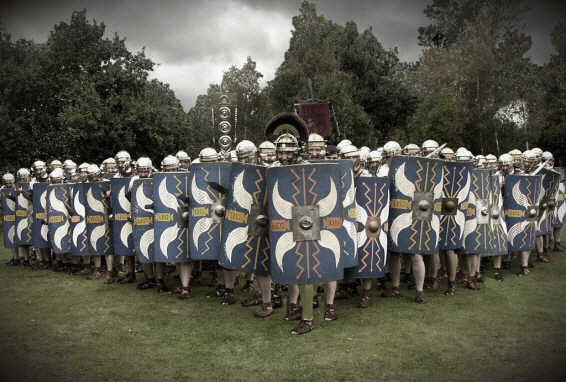 Males may join either the drill squad, which performs under the name of Vexillatio Legionis Geminae, or the civilian section. Ladies join the civilian section - there were, unfortunately, no women in the Roman army. All members receive a bi-monthly news sheet, the 'Imperial Courier' and a an annual journal 'Cornu' and are invited to participate in our varied programme of public events. In addition, everyone in the Society is welcome to attend our annual Saturnalia festival and other events of interest such as guided archaeological tours, and lectures. Those recruits who wish to join the legions or the auxilia must be over 16 (or 14 with parental permission) . They will acquire tiro status and be issued with a genuine Roman name , some basic equipment and the patterns for a tunic and focale (scarf). It is anticipated that soldiers will want to buy their own equipment in due course, but the purchase of this can be staged over a period of years to avoid excessive expense. Full kit costs in the region of £550 and can be obtained by arrangement with the Centurion. If you wish to join up, then either fill out our "full colour" application form or opt for the "printer friendly" version. Please return your remittance to the recruiting officer at the given address. We look forward to welcoming you into the RMRS !! Note: This picture has extra (digital) legionaries!